We have a wide variety of genuine fossils, all responsibly sourced. 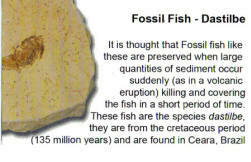 We supply information cards with all our fossils, some of which are illustrated alongside the fossils to which they refer. We normally have the following types of fossil in our showcase at Bookcase. We can also sell these online but prices exclude postage. Below is a small selection of what we normally have available. A £1 coin is included in some photos to show the scale. These part jaws from Morocco are on a matrix measuring approximately 6 by 5 inches. Measuring between 19 and 50 feet long, these swimming reptiles are known as the T-Rex of the Seas. Fossil shark's teeth - about 20 million years old - from £5 each. Sharks are the oceans' most successful predators. These fossil teeth comes from sharks that lived over 20 million years ago. As sharks have no bones, only cartilage, their teeth are the only part that survives as fossils. 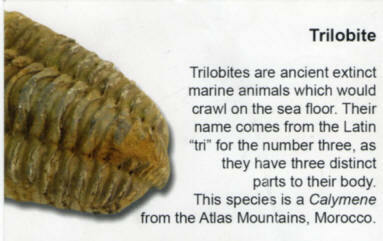 Trilobites are the first creatures known to have eyes. Ammonite pairs - £6 each pair. Ammonite fossils, split in half and polished to create a matching pair showing the intricate details inside. Postage will be added at cost for online purchases.